Schlitz work is mainly an investigation of space, or more precisely, an inquiry of the relationship between architecture and the body. Her work is sensitized to the space we inhabit. However, the drawings don't only reference the physical architecture but also functions as metaphors, mirroring a mental space. The space in between is significant, as it consists of a set of relations that delineates positions and makes lines click into place. Schlitz architectural concerns have always been stimulated through travel. 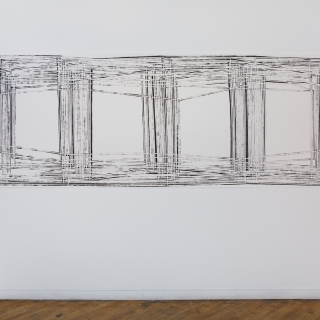 During extended work stays and while participating in several artist residency programs in the US, Schlitz worked on complex large size line systems, two of them are included in the show. She uses the geometrical reduction as a kind of grammatical scaffold to create meaning within the (image-) space. While exploring the unknown space, namely the foreign urban surrounding, Schlitz uses sketchbooks and small pads. 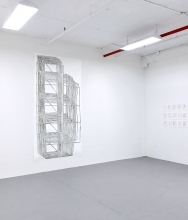 The resulting drawings function as a reservoir of forms, rhythms and tectonics as well as autonomous works. Since 2014 Schlitz generates lines with a special technique. The large paper format forces her to climb a high ladder while drawing. She uses white tape on white paper to make the lines. Because of her precarious position and the weak color contrast there is only a vague control over the ongoing drawing process. When the tape-on-paper-drawing is finished she is following the taped lines with freehand brush strokes. After stripping off the tape, the white lines rest like the ghostly presence of precision surrounded by the random brushstroke. 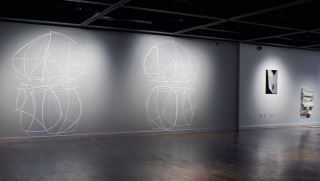 In her work, the use of line represents both the seen and the unseen. Schlitz is interested in emphasizing the tactile qualities of the line that evoke a distinctive presence while a certain absence of something is palpable. Schlitz work is responsive to the experienced space. It is space related and functions as an installation. It relates to the actual show room by connecting floor and ceiling through extreme verticality. 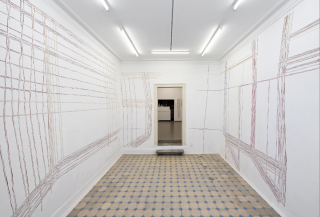 In recent projects Schlitz expands her drawing practice directly on the present walls and ceilings (2016 Brooklyn Art Space, 2017 Galerie Oberwelt Stuttgart, 2017 Galerie der Stadt Kirchheim). 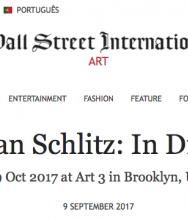 Schlitz graduated from University of Arts Berlin (MFA). She has taught art at several German and European art schools. She worked as an Assistant Professor at the Academy of Fine Arts Stuttgart (2000-2006) and was teaching as lecturer of fine arts at the University of Educational Science Weingarten (2012-2015) , as Visiting Artist at the Accademia delle Belle Arti di Brera in Milano (2006) and at Haute Ecole des Arts et de Design in Geneva (2008). In 2014 she received her B.Sc. in Psychology at Fernuniversität Hagen. 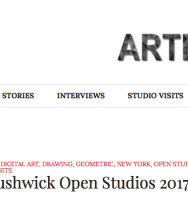 Schlitz has been awarded the MacDowell Colony Residency (2017), Trestle Gallery Visiting Artist Residency, the Millay Colony Residency, Austerlitz, NY; the Omi International Art Center Residency, Ghent, NY; Villa Serpentara Residency, Italy; DAAD Residency. She received several grants among them grants from Gisela und Erwin von Steiner- Stiftung, München; Karl-Hofer-Gesellschaft Berlin; Berlin Senate. 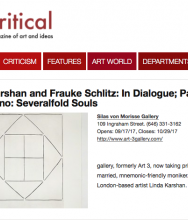 The work of German artist Frauke Schlitz has been exhibited in solo and group shows at museums, art galleries and art institutions nationally and internationally. Including shows in Berlin (oqbo gallery, Berlinische Galerie, Gallery of the University of Arts, Galerie Soma, Karl-Hofer-Gesellschaft, Haus der Kulturen der Welt, Panzerhalle, Projektraum Kunst Quartier Bethanien), in Stuttgart (Galerie Oberwelt e.V., Kunstverein Gästezimmer, Württembergischer Kunstverein, Kunstbezirk), in Karlsruhe (Städtische Galerie), in Ulm (Museum Ulm) and Italy (Galleria Formentini, Milano), Czech Republic (Biennial of Drawing, Pilsen), Luxembourg (Konschthaus beim Engel) and the US (Shiva Gallery, NYC). An upcoming solo show is at Kunstverein Brackenheim, Germany in February 2018. My art practice is mainly an investigation of the phenomenon of space. It refers to architecture and topography and their relationship to the body, which itself is the precondition for experience. For me the experienced physical and virtual space is not a continuum. Within my work references to architecture and topography function as metaphors. These serve to mesure the mental space, filled with inner constructions and subjective representations. My work encompasses both the two-dimensional and the three-dimensional. In both forms, I always adress the space in between. The negative space and the void is an important concern. For me the geometrical reduction is a kind of grammatical scaffold to create meaning within the (image) space. Analogue to musical composition I use repetitive forms as well as slightly shifting variations and modules to rhythmizise space in an intuitively growing way which includes random processes, lack of control, and inaccuracy. The resulting line, grid and knot structures, both in my works on paper and in the installations, generate complexity which is not logical but sensual. The material qualities are essential. I am interested in emphasizing tactile qualities that evoke a distinctive presence. At the same time a certain absence of something is perceptible.